The BC Council for Families – Offers a wide range of resources and publications, available in multiple languages and aimed at strengthening and supporting families. Kids Health – Information about health, behavior, and development from before birth through the teen years. Government of BC ECE Development – A listing of programs and services designed to ensure children get the best possible start in life. Affordable Childcare Benefit– Information regarding subsidy for child care. 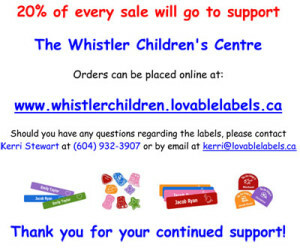 Lovable Labels – The stylish way to label your child’s clothing, shoes, lunch kits, and more!